Hart Prairie Methodist-Episcopal Church stands just off County P in the town of Richmond.The historic church,which is believed to have been built in the 1850s by Norwegian immigrants, is undergoing restoration thanks to a Georgia Kestol-Bauer, a descendent of two of the church’s original members. The church is the second Norwegian-American Methodist-Episcopal church built in the world, Kestol-Bauer said. The first resides in Cambridge, Wisconsin. TOWN OF RICHMOND Hidden off County P, up a short gravel road and tucked behind some bushes and a gate sits Hart Prairie Methodist-Episcopal Church. Georgia Kestol-Bauer stands in the doorway of Hart Prairie Methodist-Episcopal Church in the town of Richmond. Kestol-Bauer is putting a lot of personal time and financing into restoration of the historic church. In the middle of East Richmond Cemetery, flowers surround the church with its chipped white siding and plastic-covered windows. The church, N7372 County P, believed to be built in the early 1850s by Norwegian immigrants, is deceiving to the eye. What appears to be a deteriorating building is a historic part of the town’s history. The church is undergoing a restoration spearheaded by the descendent of one of the church’s original members. Georgia Kestol-Bauer, 72, is the great-granddaughter of Peder and Anna Kjostolsen, who later shortened the family name to Kestol. The couple attended the church when it first opened, and they might also have helped build it, Kestol-Bauer said. Details on when exactly the church was built are fuzzy, but Kestol-Bauer believes it was sometime in the early 1850s. During that time, Norwegian immigrants living in the area divided. One group went to a Lutheran church near Whitewater Lake. 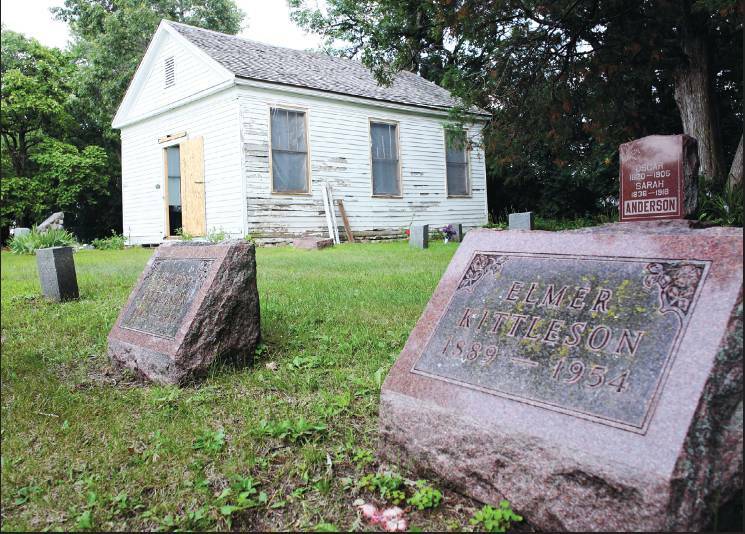 The others created the Norwegian-American Methodist-Episcopal church named Hart Prairie. “That’s what makes this unique,” she said. Church records listing members indicate the church was active in 1852. In blue ink, delicate and intricate cursive lists the former century’s members. It’s believed the church closed its doors around 1920, Kestol-Bauer said. It’s not known if services were held every Sunday until its final days, but Kestol-Bauer knows gatherings took place until then. In 1995, Kestol-Bauer began taking care of the cemetery after her uncle, Joey Kestol, died. While Kestol-Bauer walked around the partially restored church Tuesday, she pondered why people left and what the church looked like in its heyday. 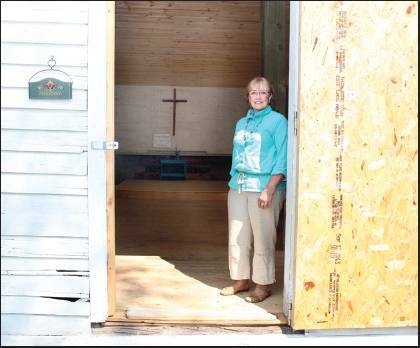 “I think as time went on, bigger places were built … People moved away and went to a different church,” she said. Her own family left the church in 1872 to join the Richmond Methodist Church. Kestol-Bauer grew up in Janesville. The restoration at Hart Prairie began in 2006 after the township considered demolishing the building because of safety concerns. In 2006, the church’s foundation was replaced and its roof redone. 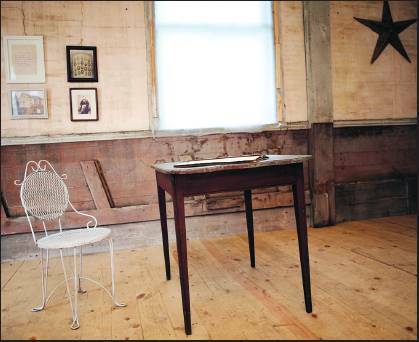 A letter and photos from the 1850s, including a portrait of Kestol-Bauer’s relatives, hang on the original walls of the church. In fall of 2013, Kestol-Bauer was told the church was structurally unstable. She poured more money into the building. Beams and tension ropes were added, and the floor, ceiling and altar were restored. Inside the church, holes speckle the walls and faded marks from furniture and a church organ destroyed by vandalism show impressions of things long past. Wood nailed into the walls alludes to 10 rows of pews that are no longer—for now. Left on the to-do list is restoring the church’s original front doors that now lean next to the new altar; fixing the windows; painting; plastering part of the interior walls, and fixing the faded exterior. Kestol-Bauer, who has invested her own time and money, is determined to finish the restoration as soon as possible. The only snags are finances and community participation, she said. “You don’t realize it’s going to cost so much to do a little thing,” Kestol-Bauer said, sitting in a chair at the church smiling. But it’s worth it, she said. Last week, a group of about 20 people from the Walworth County Cemetery Association gathered at the church for their annual summer meeting. It was the first time anyone had stepped foot in the church in more than 90 years. Kestol-Bauer’s goal is for the church to be used for meetings, weddings, baptisms or even summer services:regardless of religious denominations. When asked why she puts in the effort, her answer is firm.